Nematanthus is a genus containing approximately 30 species found in the montane forests of southeastern Brazil. Most nematanthus species have a trailing or bushy growth habit and grow well in hanging baskets. 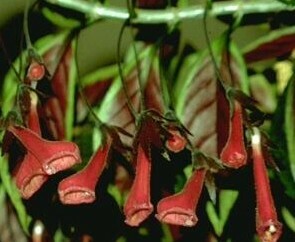 Their vigorous growth rate, unique blossoms, and hairy or glossy leaf texture make them stand out from other gesneriad counterparts like Aeschynanthus and Columnea. However, their seasonal or sporadic blooming period may make them undesirable for some growers. The genus was first created in the 1820s. The etymology of the name comes from the Greek nema, meaning “thread or hair” and anthos, meaning “flower.” The name refers to the thin pedicels of the hanging blossoms on many species, especially the type species Nematanthus corticola. Nematanthus is closely related to Codonanthe and Codonanthopsis. They are all within the same clade of Tribe Episcieae in the New World subfamily, Gesneriodeae. More recent DNA testing in 2013 revealed that Codonanthe is more closely related to Nematanthus than to Codonanthopsis. Nematanthus and Codonanthe grow in the same geographic area and they share the same number of chromosomes (2n=16). In comparison, Codonanthe and Codonanthopsis differ in their geographic locations, number of chromosomes, shape of their fruits and presence of corolla spurs, extrafloral nectaries, and anther connective tissue. Hybridizers have been able to create intergeneric hybrids between Codonanthe and Nematanthus, but there are no known intergeneric hybrids with Codonanthopsis. The most commonly cultivated species of this genus are Nematanthus australis, N. gregarious, and N. wettsteinii. Their orange blossoms look like candy corn or goldfish, which is why this genus has the common name, “goldfish plant.” Other species like Nematanthus brasiliensis, N. corticola, and N. crassifolius have long pedicels that hang down from the stem. Species N. albus and N. punctatus are scented. Cultivars like Nematanthus gregarious ‘Golden West’ and N. gregarious ‘Dibley’s Gold’ have variegated foliage. Nematanthus grow well in a well-draining soilless mix. They can be grown on a windowsill or under fluorescent lights with two or four lamps. Nematanthus can tolerate the typical humidity in a home of about 40%; however, their growth habit improves with increased humidity. Because they come from cooler temperatures at higher elevations, they are sensitive to extreme heat. At temperatures over 80°F (27°C), plants will rapidly lose their leaves. They will also lose their leaves due to overwatering.